We started the painting job at 10:30 after getting another can of paint and finished all the job before noon. I asked the marina staff to lift up the boat again and go back to the sea. It came up to $500 in total for the maintenance this time including the lift and paint, excluding the labor of my friends and me. It's almost the same as a normal car maintenance cost for one year. We were thinking about enjoying sailing on the shiny boat, but the wind was a little bit cold and strong, causing choppy waves, so we docked at the public pier on Granville Island, and had lunch with beer together. 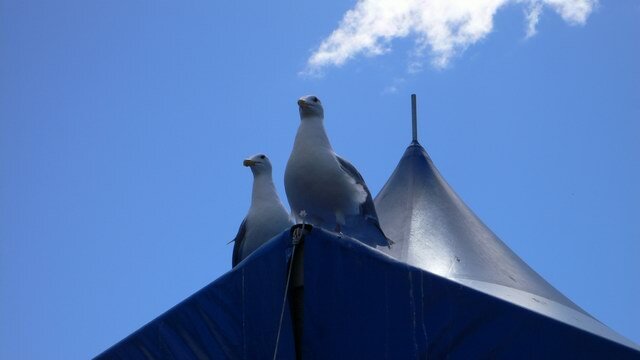 The sky was blue and quite a few seagulls were hovering. After separating, I came back home and took a shower. It was so pleasant that I took a nap on the bed for hours. A few minutes ago, I woke up. It's about 18:00 and I have two more hours before getting dark. What should I do?